I have several more photos just like this, but pointed in different directions. I'm not sure I've ever seen so much Halloween orange on the trees before. If'n you get a chance to visit the Blue Ridge Parkway in the next week, you will be in for a treat. That is unless Mother Nature throws in a few tricks. I just could not stand to post the rainy day photo I originally planned. The photo was of drops of water on grass. Blow me away with excitement! Instead, I give you blue skies and field of dreams taken off the Blue Ridge Parkway on the only day we've seen that distant bright orb this week. Good news is that the sun will come out tomorrow and I fully intend to be outdoors, starting with a visit to the Farmer's Market in the morning. Additionally, I will try to get some photos of little Miss Annie. My husband put down the sander and told me he was gonna take a shower and then asked if I would lay down the hoe and join him later for a Sunday drive along the Blue Ridge Parkway. "Twist my arm some more or handcuff me please," I teased. So at 4 o'clock today, we began our weekend of relaxation. My husband raised the lid on his beloved '59 Ford Retract and we cruised to the sounds of nifty fifty tunes. Tis the start of the Parkway season. The scent of wild roses, wild pink catawba rhodos contrast against the blue skies and the lush green mountains await visitors this week. I saw many photo ops and plan to return soon for *cough* serious work. May I suggest you come up here and play soon? Yesterday evening, after having checked the mail, I wondered the Valle. I stopped bu Sarah's field and was compelled to take photos of her aging fodder with the green grass of hope beginning to take cover. I used a method called TTV (Through the Viewfinder) to take this image. Here is a Ttv tutorial. This is not the first time I've ventured in TTV land, but was inspired to reach into my bag of old cameras tricks to manipulate some vintage to the scene. I was encouraged partly by the images on display at the Turchin Center for the Appalachian Mountain Photography competition. I was one of three judges honored with the challenging, yet humbling experience. Dude, there are some hot shooters in the High Country! Be sure to check out the link above to see the exhibit or visit this AMPC site to vote for the "People's Choice Award." The contest supports the Appalachian State Outdoor Programs and runs in conjunction with the popular Banff Mountain Film Festival World Tour which will be shown in Boone on March 28th. I fell out of bed early Saturday morning. Without brushing my teeth or hair, I pulled on Friday's pair of jeans and stumbled into the Jeep and steered towards the Parkway. I headed north at Blowing Rock and quickly turned around because the cloud cover wasn't going to allow for a striking sunrise. I traveled south and hit Price Lake. That's where I met the first photographer. The light was dull and I briefly considered bagging the trip and going back to bed. But I figured while I was out there, I would do a bit of leaf reconnaissance so I would know the better areas to go to at a later time. I ventured to the boat area at the lake. That's when Mr. Sun decided to do his little thing. It was fairly magical. After 20 minutes I packed my gear and drove to Grandfather. By the time I got to Rough Ridge I had already passed at least 20 photographers. As I crossed the viaduct, add at least 50 more lens slingers to count. I think this section of the Parkway most be highlighted as 'the place to shoot autumn,' in some landscape photography magazine. I'm gonna look for a different spot just to be rebellious. For those keeping track of the leaves, peak on the top is just days away. Barring a major windstorm, autumn will stay around a while. It is gorgeous everywhere and you won't be disappointed. Note to self: Your bogen tripod is tired, in fact, it is dead. Time to get a new one. 1) My brother is doing much better. He is nearly ready to be released from jail the hospital. 2) My youngest is thriving at school. She's looking very college-y. 3) My eldest played Army all weekend and lived to tell us all about it. Can't wait to see her ride in a tank. It never ceases to amaze me that I sometimes get paid to take a hike. Today I covered various assignments along the Blue Ridge Parkway. I traveled Rough Ridge (near Grandfather Mtn.) all the way to Doughton Park. The only thing missing from the day was having someone with whom to share the occasional natural delights. After climbing a particularly exhausting summit, I looked down and out and said over my shoulder to no one in particular, "Whoa! Check out that view." Now it is late at night and as I post this, I realize that not only do I get to relive the moment from the comfort of my chair, but I also get to share it with you as well. Ain't blogging grand? This is another photo taken at sunrise yesterday morning. I was on top of Grandfather Mountain . It was windy and cold, but not too cold. I was tempted to cross the Swinging Bridge, but chickened out this time. I was waiting for a photo op that sadly did not materialized within my time constraints. But what I did witness was extraordinary lighting, wild critters (including one crazy turkey) and fresh air. April may be considered a grey month up here in the mountains, but to me, it is anything but colorless. 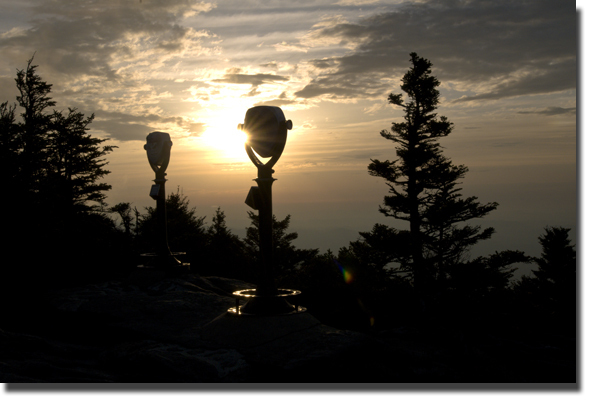 For those nearby, remember the month of April is Dollar Days at Grandfather Mountain. For a buck, you can hike the trails, see the wildlife and breathe the high life. Just ask yourself: When was the last time you crossed the Swinging Bridge? A tribute to the Mile High Swinging Bridge by the late Charles Kuralt . 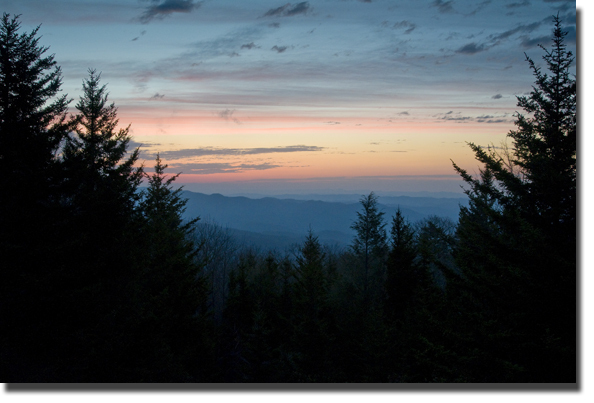 This is merely a glimpse of what the Blue Ridge Parkway looks like at 6:30 a.m.